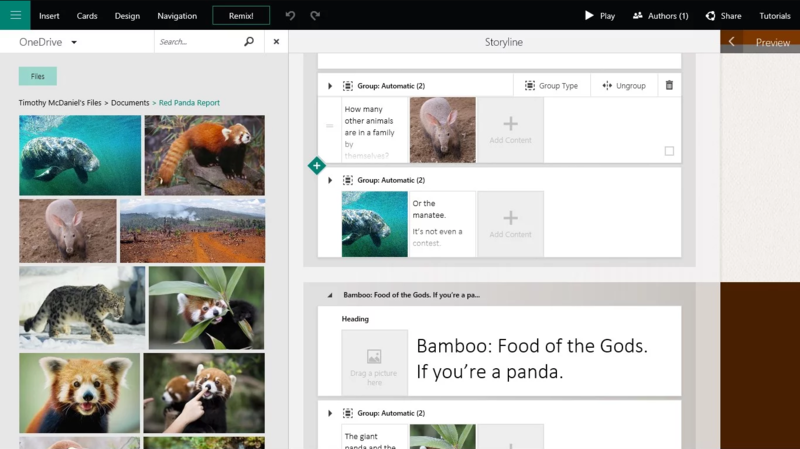 Microsoft Sway comes in two forms. The free version, which is available for anyone with a Microsoft Account (Hotmail, Live, Outlook.com etc), and Office 365 Sway, which is bundled in with Office 365 licenses. It helps you and your colleagues express ideas using an interactive, web-based canvas. It lets you quickly and easily produce great interactive designs including images, text, documents, videos, maps, and more. Sway is great for use across multiple browsers and devices, with responsive layouts that adapt to whatever screen a presentation is being viewed on. Isn’t Sway just the same as PowerPoint? You might think that, as they’re both presentation tools – but there are some key differences between the two. Sway has a mobile application and is easier to use if you’re making something such as a short presentation (it’s great for presentations in school for example), while PowerPoint has a long-running experience and has business audiences on its side. That’s not to say these two products are new/old, online/offline, though. They’re very much designed to be complementary to each other, with each covering the other’s shortcomings. Basically, you don’t have to choose – you just need to know when to use one and when to use the other. If you’re creating data-intensive presentations, PowerPoint is more the way you’d want to go, with a range of predefined templates designed to make these stats pop. If your presentation includes a lot of videos or other web-based content, consider giving Sway a try. Alright, I’m sold. How do I get it? Well, as mentioned above, if you’re already an Office 365 user or have a Microsoft Account, you already have it! You can access Sway from your Office 365 portal by clicking on the waffle icon in the top left of your screen and choosing it from the app list.